Cinema, built by Jan Wils, interior design: Oscar Rosendahl. Opened 29 Oct 1935 with the Austrian movie, "Episode". Later renamed "Pathé City". 2007-2010 renovations. Originally 1350 seats, now 600 seats. 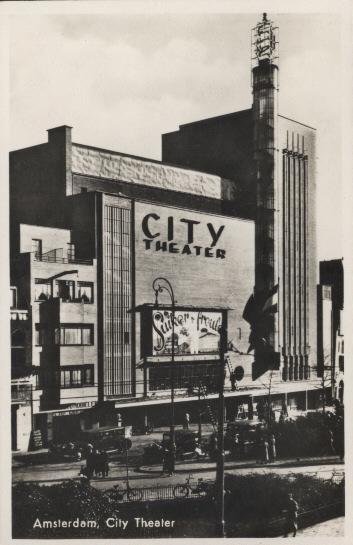 Front Text: "Amsterdam, City Theater", marquee: advertising the 1935 Dutch movie "De Suikerfreule"